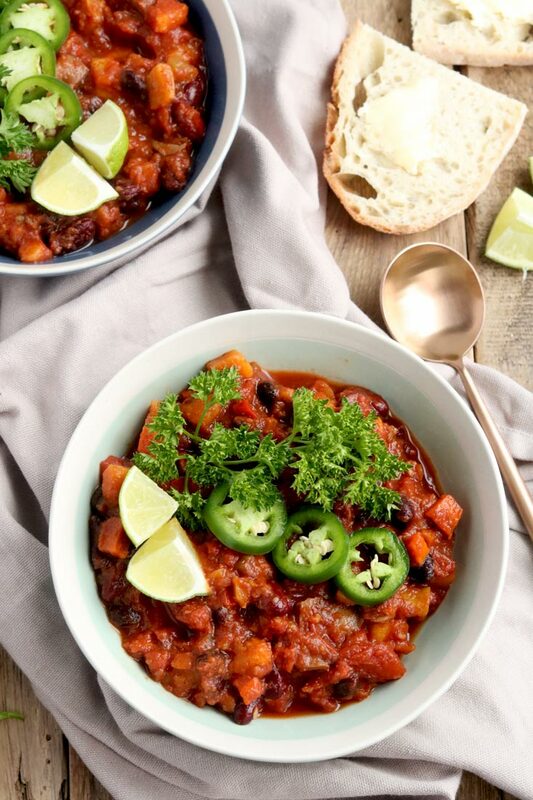 Inside Scoop: This Chunky Vegan Sweet Potato Chili recipe will have you saying bye bye to meat based chili for good, oh yeah, and it can totally be made in your crock pot! 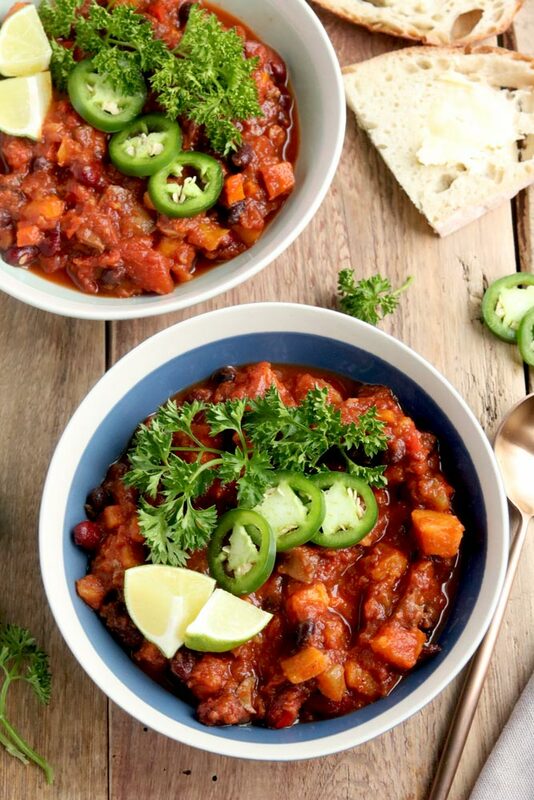 If you are okay going meat-free, you can really make chili out of anything: sweet potato, carrots, chickpeas, eggplant (we haven’t tried the eggplant version, but we would totally be down for it). Chili is really all about the wonderful spices: chili and cumin! We actually don’t know how many times we’ve been told that chili needs meat, oh but it’s not chili without ground beef they say. 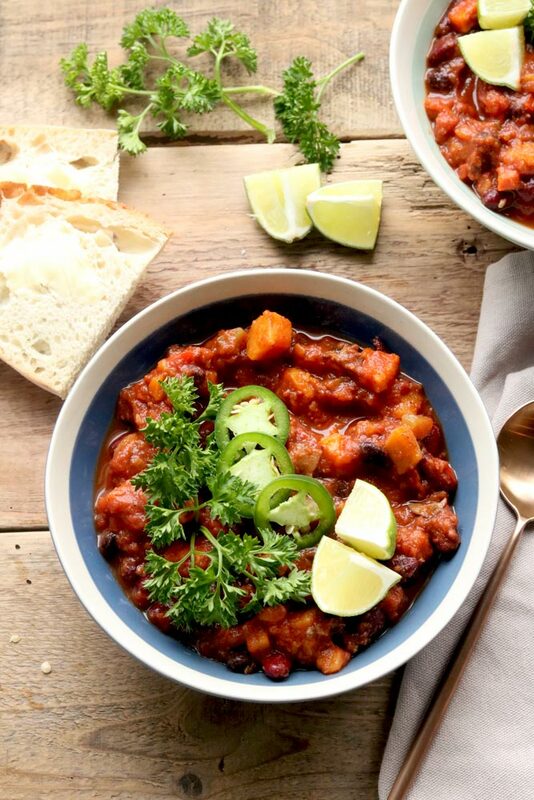 But, really, if you give this Vegan Sweet Potato Chili a try you will see that it can taste just as wonderful as if there were meat in it (and a bonus, you are basically eating a bowl of vegetables, so it’s a great way to not have just salad for dinner). 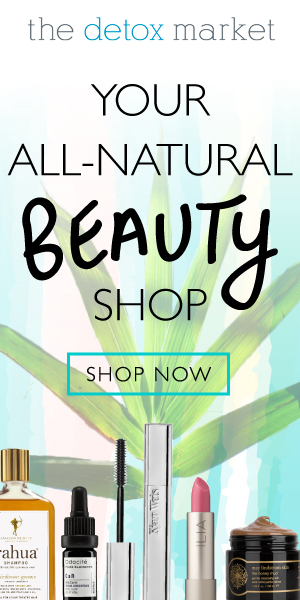 DOWNLOAD THE BEST OILS FOR COOKING HANDOUT! It’s cooling down out there, and our kitchens are heating up. 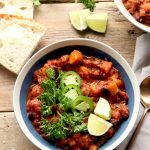 Not just our ovens, but our foods and our bellies too, this vegan sweet potato chili is flavour packed and incredibly nutritious for you. 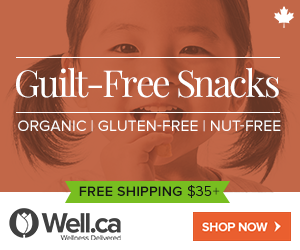 Sweet potatoes are hands down one of our favourite nutrient packed foods. 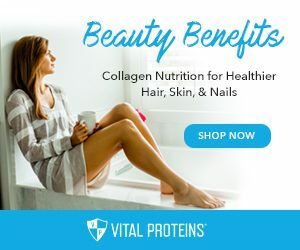 They are rich in beta-carotene (which is a precursor to Vitamin A, a fat-soluble antioxidant), and contain some pretty amazing anti-inflammatory health benefits due to their anthocyanins (pigments). The potato paired with all the diced veggies and beans make this meal well rounded and filled with all your macronutrients. 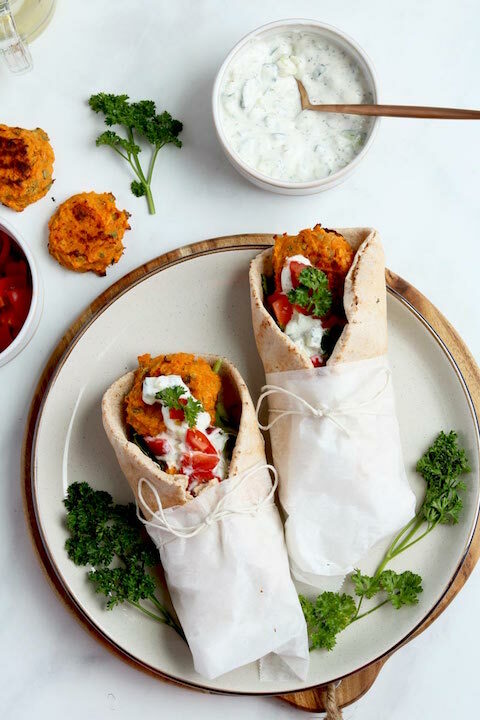 Our favourite way of enjoying this meal is by adding a dollop of yogurt (your choice, vegan or not), avocado, and some scallions. If you’re looking for another awesome sauce cooler weather recipe, you need to try this Winter Squash, Leek & Vegetable Soup. 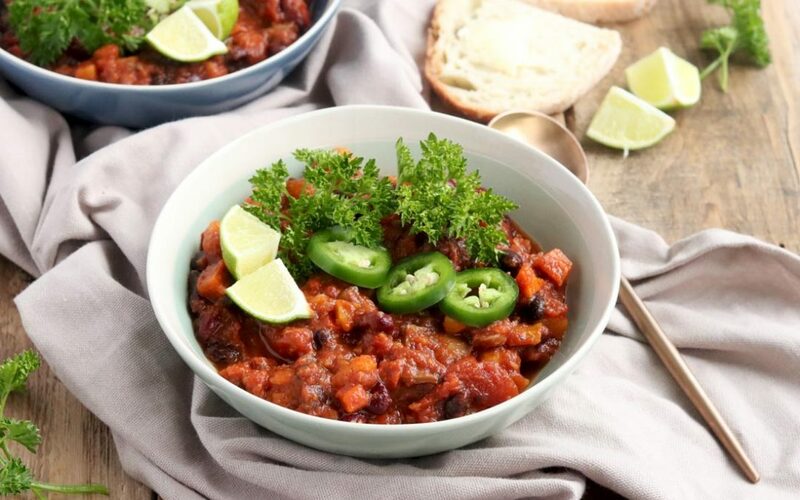 Drop us a comment by telling us how you like to enjoy vegan chili! 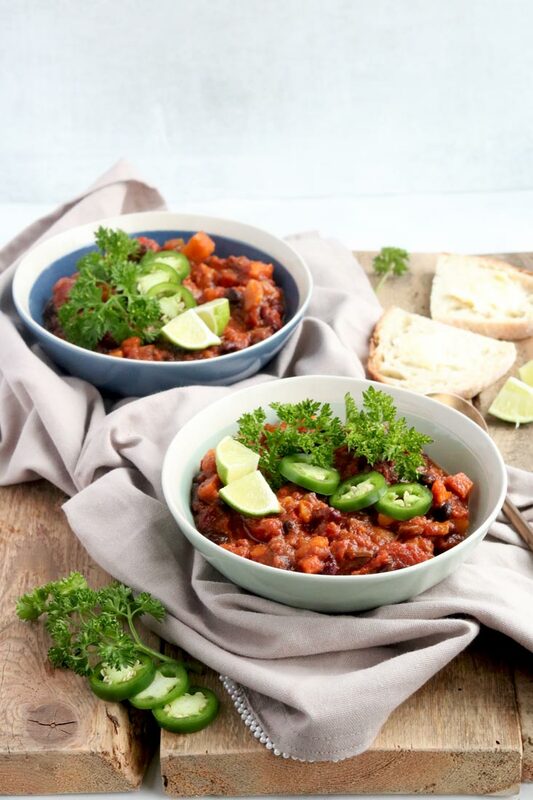 This veggie loaded sweet potato chili is flavour packed and incredibly nutritious for you. 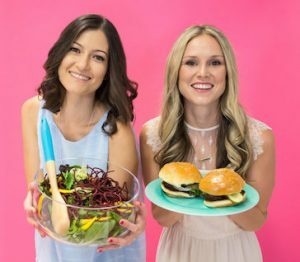 High in plant-based protein, fiber, antioxidants and just loaded with veggies, an amazing salad alternative. Heat a large pot or dutch oven over medium. Add 1-2 Tbsp oil to pot. Add in onion, garlic, celery and carrot a dash of salt and pepper. Stir until soft, about 7-10 minutes. Add in tomato paste and red wine and cook down for about 3 minutes. Add in tomato puree, bouillon cube, water, diced tomato and spices. Stir and cook about 1 minute. Add in rest of ingredients (veggies and beans). Place lid on and cook over medium-low heat for about 30 minutes. Take lid off and cook another 15-25 minutes (reduce) until desired consistency. 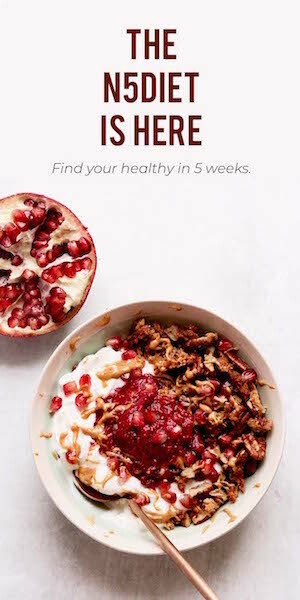 Add all the ingredients to your crock pot and cook on low for apx. 8 hours.